More November solicitations -- and much more! 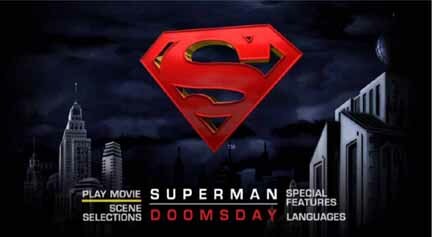 The Continuum today begins a series of reports on the Superman Doomsday movie with a look at the screen menus for the DVD. The film, which kicks off Warner Home Video's series of new animated movies from the DC Universe, will be in stores on Sept. 18. It stars Adam Baldwin as Superman, Anne Heche as Lois Lane and James Marsters as Lex Luthor. Click on the thumbnails for larger images and look for interviews here in The Continuum with the creators of the movie leading into Superman Doomsday's release. * George Newbern, who voiced Superman in Justice League and Justice League Unlimited, returns to the character in the two-part season opener of The Batman, which will premiere on Kids' WB! on Saturday, Sept. 22. "It's a slightly younger Superman, a little bit remote and serious than some others we have seen," story editor Michael Jelenic said. "I think George Newbern's voice fits this version. He made it work perfectly." * Both Superman: The Animated Series and Batman: The Animated Series will premiere on JETIX/Toon Disney in September. For covers and six- to 10-page previews of Marvel Comics titles arriving in stores on August 29, CLICK HERE. Titles include Avengers: The Initiative #5, Black Panther #30, Fantastic Four #549, The Last Fantastic Four Story, Silver Surfer: Requiem #4 and World War Hulk: X-Men #3. For previews of Marvel Comics titles arriving in stores on Sept. 19, CLICK HERE. For previews of Image Comics titles arriving in stores on August 29, CLICK HERE. For covers and two- to three-page previews of Archie Comics titles arriving in stores on Sept. 19, CLICK HERE. Titles include Sonic the Hedgehog #179 and Jughead #184. * Aspen Comics has released its exclusives for the Canadian Nation Comic Book Expo in Toronto this weekend, including the premiere of Iron and the Maiden #2 and the Aspen Fathom: Kiani Toronto 2007 Tour Print. * USA will broadcast the Hulk movie on Saturday at 2 p.m. FX will telecast X2 at 7:30 p.m. on Saturday. * Heroes' Hayden Panettiere will be a presenter on The Emmy Awards, which will be televised by Fox on Sunday, Sept. 16 at 8 p.m.
* The Fantastic Four animated series is not currently on Cartoon Network's schedule for September. * Sunday, August 19: 30 Days of Night, Zenescope First Looks and Archie Comics First Looks. * Saturday, August 18: Smallville's Erica Durance, Digital Webbing for November and First Looks. * Friday, August 17: Scarlett Johannson joins The Spirit, Red 5 Comics for November, Marvel Comics First Looks and The Batman. * Thursday, August 16: Dark Horse Comics for November, Image Comics First Looks and Marvel Comics First Looks. * Wednesday, August 15: Painkiller Jane, the Lost Squad movie and Marvel Comics First Looks. * Tuesday, August 14: Christina Z. on Shadow Hunter, Feedback vs. Mega Snake, Wonder Woman, Avengers/Invaders, Marvel/Dabel split, Painkiller Jane, Dynamo 5 and First Looks. * Monday, August 13: 30 Days of Night, IDW Publishing for November and from Wizard World Chicago -- WildStorm and Avatar Press panels. * Sunday, August 12: From Wizard World Chicago -- The Dark Knight panel and Aspen Comics panel. * Saturday, August 11: From Wizard World Chicago -- DCU panel, Marvel's Cup O' Joe panel and Mark Millar/Bryan Hitch on Fantastic Four and DC's Vertigo panel; Heroes, Who Wants To Be A Super Hero? and Image Comics' The Overman. * Friday, August 10: From Wizard World Chicago -- Mondo Marvel panel, DC Nation panel and X-Men panel, The Spectacular Spider-Man animated series and Marvel First Looks. * Thursday, August 9: Image Comics First Looks, Marvel Comics First Looks and HBO in October. * Wednesday, August 8: Flash Gordon and First Looks. * Tuesday, August 7: Flash Gordon's Karen Cliche, Iron Man movie, Incredible Hulk movie, Image Comics Firs Looks, Devil's Due Publishing First Looks, Image Comics' Proof and Amazing Spider-Man. * Monday, August 6: Legion of Super Heroes, Heroes, Avengers Reborn and Flash Gordon. * Sunday, August 5: Stardust and First Looks. * Saturday, August 4: Spider-Man 3 DVD and First Looks. * Friday, August 3: The Spirit casts Gabriel Macht, Flash Gordon and Marvel First Looks. * Thursday, August 2: Legion of Super Heroes, The Batman, Teen Titans and First Looks. * Wednesday, August 1: The Spirit film, new Punisher movie, IDW Publishing's new titles, First Looks and Spider-Man: One More Day covers. * Tuesday, July 31: Bluewater Productions for November, Heroic Publishing for November, Moonstone Books for November, First Looks, Aspen Comics roundup and Ed Burns at Virgin Comics. * Monday, July 30: The Simpsons Movie, WildStorm, DC Big Guns, WildStorm and Fables. * Sunday, July 29: The Incredible Hulk, Sam Raimi, Todd McFarlane, Spider-Man, MINX titles and Marvel's Ultimate Universe.